Austin Kearns decided to sign with the Cincinnati Reds after being selected seventh overall in the 1998 Major League Baseball Draft. After three seasons in the Reds' minor league system, he made his major league debut on April 17, 2002. On July 30, 2010, Kearns was traded to the New York Yankees and currently plays for the Cleveland Indians. 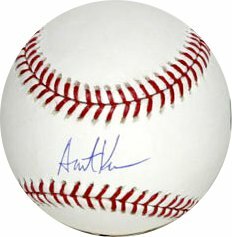 Austin Kearns has hand autographed this Official Major League Baseball. TriStar Productions Hologram and Certificate of Authenticity.